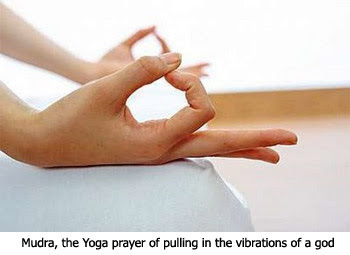 Is the meditation of Yoga the meditation of the Bible? 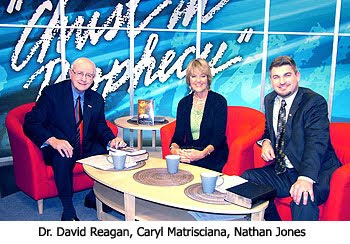 Dr. Reagan and I on our ministry's television show Christ in Prophecy had the pleasure of asking this question of our special guest Caryl Matrisciana. Caryl is a best selling author and filmmaker and is a recognized expert on Eastern religions, contemporary cults, paganism and the occult. She has been involved in the production of more than 60 documentaries over the past 30 years. Her biographical testimony Out of India explains how she grew up under Hinduism in India and lived it in England and the U.S. as a New Ager before accepted Christ as Savior. She joined us warn us of the dangers of equating Yoga with Christianity. Nathan Jones: What is that third finger, hands on the knees thing Yoga practitioners do when they sit cross-legged? Caryl Matrisciana: You shouldn't do a Mudra like that, because that is believed to be part of the prayer where you pull in vibrations. You hold your hand in a particular way and you say that word "Aum" which is a vibration of a god, because everything is god consciousness. Our positions and our repetitive prayers are called Mantras. You say the name of the deity and they believe that the vibrations from saying "Aum" connects you to the vibration that began the world. You see, the basis of Yoga is evolution. Evolution is the faith of Hinduism, believing that everything is becoming better. If you are a Bible believing Christian, you understand that nothing is getting better. We are on a decline and we are getting worse. Christianity and Evolution/Hinduism are two opposing worldviews. Yoga is designed to make you feel better because those who practice it believe it is encouraging the divinity within you to realize your full god consciousness. In actuality, you are getting involved in a lie. It's a deception. Why not just do good physical exercises as Paul said that profits our body? A little bit of physical discipline, well that's certainly fine. But, then, why don't we meditate on the incredible things that God has done for us, which is what true meditation is all about? Dwell on the promises of God. Don't put your mind into a vacuum for an experience of wanting to make yourself feel better so that you can come into the presence of God. Now, when I was a Roman Catholic, we practiced the presence of God. That is when you go into a Roman Catholic Church and the red light is burning on the altar which is to tell you that the Eucharist has made the piece of bread there into the actual body of Jesus Christ. When you come into a Catholic church and make the sign of the cross, you are practicing the presence. You are walking in a mystical worldview with your mind and reason telling you that that piece of bread is actually Jesus that is going to be crucified again during mass so that in a mystical way you can feel the presence of Jesus. When I became a Bible believing Christian I had to toss that out. I had to repent of those feelings and now rely on the promise which says that Jesus will never leave me. It is a completely different walk of faith versus experiencing through subjectivity. Now, I may not always feel like I am in the presence of Jesus when I walk by faith, but Jesus said He would never leave me. He will never leave me alone. He is my comforter. He is the lifter of my head. He is my boardwalk. He is my sustainer. He is my sufficiency. Those are the promises that I have to depend on in faith. Dr. Reagan: Christian meditation never consists of emptying one's mind to become a vacuum. It should be meditating on Scripture, reading Scripture, and thinking about Scripture and the character of God. Nathan Jones: King David said that quite a lot, that we should meditate on God's Word day and night. David was not talking about the type of meditation that Yoga is teaching, right? Caryl Matrisciana: Biblical meditation is the meditation on the character of God. "How good you have been to me, God. How merciful you are to me. Thank you for dying to give me eternal life. Thank you, I am a worm. I've been separated from you by sin." Whereas, in Hinduism you are not considered a worm, instead you are considered divinity, and to be divine you've got to waken it. Also, you mustn't have a low self-esteem of yourself within Hinduism and Eastern Mysticism. You just have to go to India to see this doesn't work. In India there is huge poverty, mass starvation, and depression. If Yoga worked in India these people would be elated, but they're not. In the last part of this series "Christian Yoga" with guest Caryl Matrisciana, she'll explain the significant differences between Christianity and Eastern religions. 103 How sweet are thy words unto my taste! yea, sweeter than honey to my mouth. I just have to laugh at the barrage against yoga--particularly yoga as exercise. First of all, a lot of it is JUST exercises and stretching, and yet Christians screech at the top of their lungs--It's a SIN! It's a SIN! So, if that's true, then consider this: MANY exercises and stretches are yoga-based, so if yoga is such a sin, then so are these exercises and stretches, and you'd better not even so much as raise your hands above your head in a stretch or (heaven forbid) get any exercise in any way lest you be "sinning." And lastly, many of the same people who raise such a brouhaha about yoga have absolutely NO problem whatsoever watching karate movies or enrolling their kids in karate classes or taking karate or karate chopping something or even just pretending like they know karate. So if you're going to say that all yoga is straight from the pit of hell, don't be a hypocrite: Be sure to condemn all exercises, stretches, yoga mats, yoga rooms, yoga moves, etc. and while you're at it, be sure to condemn karate, karate chops, Karate Kid I, II, III thru XV, Kung Fu Panda I and II, Chuck Norris, Jacky Chan, "Hiiii-yah!! !," and so on! Anonymous said "(Snort!) ABSOLUTELY RIDICULOUS!!!" If a log of wood is fashioned as a ‘god’ and becomes the object of a person’s full attention; then it isn’t the wood that is evil, rather the focus of the mind/soul that is sinful. Every movement of the body is exercise. Walking, breathing, whatever - is implementing specific groups of muscles to aid bodily function. What is the objective behind making the sign of the cross? It is an exercise of the muscles and tendons obeying the brain which is directed by the mind toward the worship of a false god. As are placing hands together an outward show that the mind is acknowledging a god. Movements in themselves are the body/brain obeying the instructions of the mind/soul. Yoga is a specific set of movements designed by the occult in worship of self. SELF is the object of absolute attention needed to make the body perform beyond what it is purposed for. Yoga is the outward evidence of self idolisation which demons encourage. This is true of ANYTHING that absorbs our full attention and separates us from fellowship with a HEAVENLY Father Who transcends time and His creation. Unlike the self orientated darkness of Hinduism and their self gratifying Yogic exercises; a Christian is instead told to deny self, to have the mind of Christ, and have nothing to do with the teachings of demons. Well said EI, and spot on!